jerrythepunkrat.com: What do retro video games and branding have in common? What do retro video games and branding have in common? Great retro games thrive on simplistic features. So do great brands. Think about it: Pong, Super Mario Brothers, Asteroid, Galaga, Street Fighter, Donkey Kong...what makes them great? Their designers chose a limited feature set and ran with it as far as they could. The best classic games feature a limited skill set that is thoroughly explored through level design. Abilities are gradually introduced in non-threatening environments, interplay between the various abilities is explored, and environmental safety is removed. Super Mario Bros. is all about jumping. 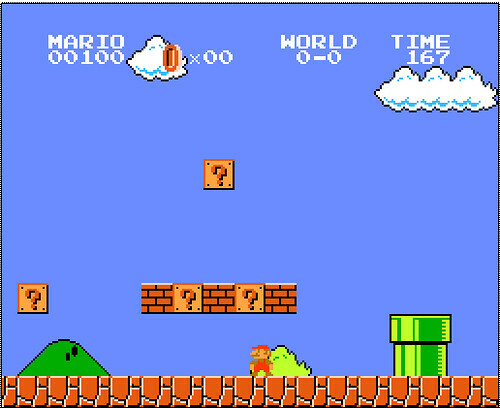 Mario jumps over holes and onto pipes and platforms. He jumps over or onto enemies. He jumps to collect coins and break bricks. He jumps to reach the top of the flagpole. Mario's fireballs bounce, forcing him to jump for extra precision when aiming. The vast majority of gameplay possibility is designed to reinforce the core mechanic of jumping. Great brand chase the same philosophy of simplicity. Take In-and-Out Burger for example. What do they serve? Burgers. Yeah, they have a few side-items that revolve around burgers (fries, drinks, shakes) but no other main menu item. And even their posted menu is simplistic: do you want a #1, a #2, or a #3...oh and all of them are pretty much the same burger. What does Starbucks do? Coffee. And then they iterate the crap out of that core product: sizes, flavors, cold vs. hot, etc. Granted they do throw in some food items and other beverages...and time will tell if this is helpful for their brand (I suggest that it might hurt more). And it's not just the brand's product that can be simplistic. Oftentimes it's the core purpose that should be lifted high and then explored every which way. Nike is a great example of this. They started with one shoe but now have every kind of apparel item under the sun...not to mention the hottest iPhone app for runners and one of the slickest real-time basketball promotions. But what is Nike all about? The spirit of personal victory through athletics. Everything they do is centered on this core value: their ads, their products, even their name. And no matter what they make it is only ever done through the lens of this worldview. Simplicity in branding doesn't just mean a single product. But it does mean having the guts to focus, to be an expert at your single purpose. Then you can find every means under the sun to accomplish that purpose and iterate to your heart's content. So how simplistic is your brand? Maybe you've got a million products on your retail site or maybe just one service your provide your clients, but do you know that one purpose your brand is all about? Love it! Keep the Good Work.